Shaun Jamal Phillips was born May 13, 1981 in Philadelphia and grew up across the Delaware in Willingboro. Big, fast and extremely competitive, Shaun starred in youth sports before lettering as a three-season athlete for Willingboro High in football, basketball and track. He was a two-way star for coach Ty Belford’s Chimeras, playing receiver on offense and pass rusher on defense. As a senior in 1998, Shaun was All-State with 12 sacks and one interception, and caught 25 passes—five of which went for touchdowns of 50-plus yards. Shaun accepted a scholarship from Purdue and red-shirted his freshman year as he worked to improve his test scores and bulked up to toward his eventual weight of 250 pounds. He picked Purdue because he hoped to play tight end for quarterback Drew Brees. But in 2000 he started all 12 games for the Boilermakers on the D-line, moving from right defensive end to left defensive end during the season and finishing among the Big 10 leaders with 7 sacks and 14 tackles behind the line of scrimmage. Early in his freshman year, Notre Dame tested Shaun and responded with 7 tackles. Two Saturdays later he had four tackles for a loss against Penn State. Shaun’s knack for playing his best against top-tier opponents earned him Purdue’s Newcomer Award and honorable mention in the All-Big 10 voting. He was a big reason the Boilermakers made it to their first Rose Bowl since 1966. They fell to Washington 34–24. Shaun continued to dominate his position in 2001, forcing 3 fumbles and recovering 4 himself. He also had 6 sacks and 15 tackles for a loss. Joe Tiller’s Boilermakers fell to 6–6, however, after starting strong at 5–1. They lost to Washington State in the Sun Bowl. After a 7–6 junior season—in which Shaun led the team in sacks and was named Most Valuable Lineman in the Sun Bowl—Purdue went 9–4 and finished the year ranked in the Top 20. Shaun’s final college game was a thrilling overtime loss to Georgia in the Capital One Bowl. Shaun was first-team All-Big 10 and second-team All-American as a senior, registering 14.5 sacks to set a new career record for Purdue with 33.5. Shaun did see action at tight end for the Boilermakers, typically in red-zone blocking situations, and caught a pair of TD passes. Shaun was selected by the San Diego Chargers in the fourth round of the 2004 NFL Draft. He was used as a pass-rushing specialist early in his career, racking up 11 sacks in his first two seasons. In 2006, he became an every-down linebacker and combined with Shawne Merriman to form an awesome one-two pass rush punch. 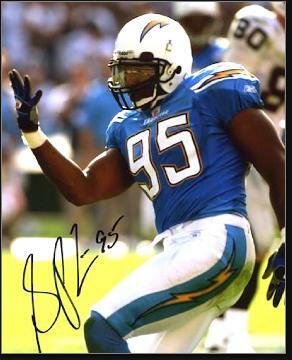 In Shaun’s first six seasons with the Chargers, he had 45.5 sacks and became an important team leader. The 2010 season, Shaun’s seventh, was his best. He led the team with 11 sacks and had a dream game against the Cardinals in Week 4. He sacked the quarterback four times and picked off a Derek Anderson pass and ran it back 31 yards for a touchdown. Shaun was named AFC Defensive Player of the Week. At season’s end, he earned his first Pro Bowl nod. Unfortunately, the Chargers fell a victory short of making the playoffs, with an 9–7 record. The team had made the postseason four years in a row before that, reaching the AFC title game in 2007, which they lost to the Patriots. After an injury-plagued 2011 season, Shaun returned to form in 2012, but the Chargers missed the playoffs. As his 32nd birthday neared, he wanted t shot at a Super Bowl ring. He signed a free agent deal with the Broncos in 2013 and helped the club go 13–3 with a team-leading 10 sacks, two forced fumbles and a key interception in a Week 8 win over the Redskins. Shaun got his Super Bowl shot that February in New Jersey at MetLife Stadium. The Broncos beat the Chargers in the divisional round and the Pats in the AFC championship, but fell apart against the Seahawks in Super Bowl XLVIII, 43–8. Shaun played one more year in the NFL. He started the year as a back-up for the Titans, who released him in late November. He was picked up by the Colts and saw action in their final five games. He finished his career with 532 tackles, 133 sacks 22 forced fumbles and 7 interceptions in 168 NFL games. Shaun got his MBA after leaving football. He had kept an eye on his money as a player, and took an active role in his investments—something many teammates did not. Going forward, part of his business plan is making sure current players exercise some wisdom regarding their finances.